They are amazing, very inspiring to see. It’s a good reminder that mass planting can be super effective, especially in a large garden. I had such fun growing annual rudbeckias this year that I’m going to do that again next spring but in a big long row like this. Beautiful thanks for sharing, I look forward to reading your book…happy writing! Hi Lynda, when will your book be hitting the shelves? I can’t wait to read it! It’s scheduled for release in September (if I finish writing it by then!). If your pen falls off the desk when you are not in your study writing; does it make a noise? I enjoyed your lastest blog, and yes I would agree the photos are beautiful, it is good to look and be brightened, since Anzac Day our family has been turned up-side-down, we nearly lost our son-in-law, but thankfully to our grandson he knew wnat to do and how. 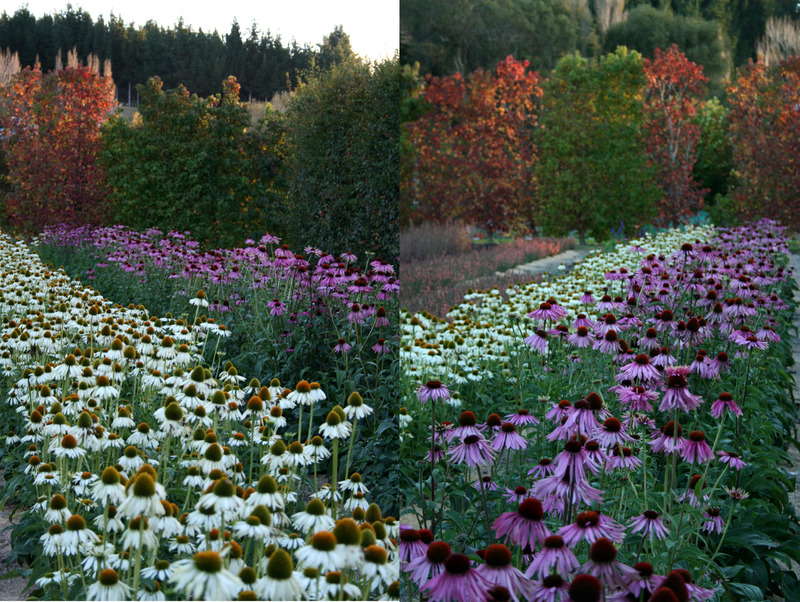 The colours of the Echinaceas are beautiful against the Autumn leaves on the backgroud trees. Just what we all need to see at this time of the year. We are looking forward to reading your book when it comes out. Has Lucus turned ONE yet. How is the wee man? Gaynor Tait; Gisborne. What a stunning planting–now where can I do this in my garden? This is just a Devine looking Garden.Yay GO Palm de Ville….my Hometown!Great Shots of one of my nearest & dearest Flower’s to my Heart.I am so so so looking Forward to the Presence of your Book.You are so Inspiring,a total Wonder Woman in my eye’s. Hello Lynda, I purchased your book ” Back To The Land ” A year of Country Gardening” last Sunday at the Warehouse. What a wonderful, read it is going to be. Thankyou so much for sharing your life, photos and family stories. I have just been reading snippets ,and browsing through at present, and have had many little giggles over things written. Makes one remember their own heritage and past. Do I guess there is another addition to your wee family? Good luck, and good health. It wiill be another helper in the garden I guess!! Take care, and thankyou for you frankness and honesty. Gaynor Tait, Gisborne. Hi Lynda, I bought your new book two days ago, and already up to late August. Really enjoyable reading. Hi Lynda- Is this book the only one you have written as I am looking for something of yours called Garden Preserves. Can you please help me. We’ve done loads on preserving in our special editions – Homegrown 1 had preserves in every chapter, and Homegrown Recipes had heaps of preserving recipes in it too, if that helps.